Passover is right around the corner and Eggwhites is ready to do all the work, so you don’t have to! Passover is a serious yet joyful celebration that is often seen as an important time for the family to gather. The Passover Seder is filled with simple yet impactful meanings as far as the menu is concerned. Planning ahead for the holiday meal is easiest with the help of Eggwhites Catering. We are well versed in the traditions and requirements of the holiday. The first night of Passover begins at sundown on Friday, March 30th, 2018. We will have everything you need whether you celebrate on Friday, the official first night or Saturday, for the second Seder. We have all the traditional favorites to complete your Seder dinner – with everything crafted in our North Miami commissary using the very best ingredients. Whether you are hosting a meal for four or forty-four, it makes perfect sense to call in reinforcements. Let Eggwhites Catering prepare the Seder meal where your family will gather to hear a retelling from the Book of Exodus. Passover is a festival that symbolizes the flight from Egypt, as well as from hundreds of years of slavery, by the Jews over 3,000 years ago. The Passover Haggadah – the book used to guide the Seder – states that everyone should “experience” coming out of Egypt him or herself. So the Passover Seder is tangible, touching on many of our senses, especially taste. This is why foods play such an important role in telling the Passover story. One of the books in the Hebrew Bible directs Jews to remember this historical event, and they do so during the first Passover dinner. The traditional retelling is widely observed by Jews across the world. Observing Passover has even found its way into other faiths with many Christians and Catholics choosing to recognize the historical significance of the event. Passover occasionally coincides with the Christian observation of Easter in March or April. One of the remarkable things about the Seder is that it’s celebrated in a similar fashion across many different countries all over the world. Hence, the same foods decorate the traditional Passover Seder Plate whether you are celebrating in Miami or New York City. An observant household would recognize the fifteen segments of the Passover Seder including Kadesh, Urechatz and Karpas, as well as many more. Each segment therefore features an action such as reciting a blessing or eating a specific type of food. The traditions that involve food at the Passover meal are meant to symbolize freedom. Each item on the Seder plate abounds with allusion and meaning. 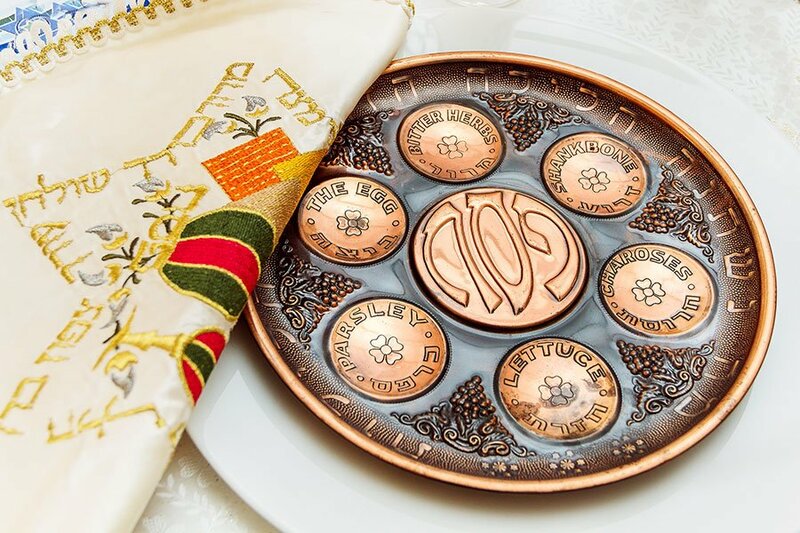 The Seder plate itself may be a family heirloom, fancy silver platter, or simple plate with individual dishes. Preparing the Seder plate is not just putting the required foods on the plate. It takes advance preparation and cooking. The Seder plate has six items on it, arranged in a special order. The Seder plate is placed on top of the covering of three matzo and is placed in front of the head of the household. Follow our step by step guide to see why each item is included, how they are prepared and what each role is in the Seder meal. The lamb’s shank bone, called a zeroah, is meant to symbolize a Passover sacrifice. The shank bone represents the lambs that were sacrificed on the eve of the ancient Jews’ exodus from Egypt. Many communities today have the custom to use a roasted chicken neck or similar. To prepare, remove as much meat as possible from the bone and roast the meat over an open flame on your stove or in the oven for about 30 minutes until darkened. The Baytzah is a roasted or hard-boiled egg which is meant to symbolize a temple sacrifice as well as the cycle of life. The egg is roasted in an oven, turning often, until the shell begins to darken. However, if you try to roast a raw egg, it will explode. You must first boil the egg in order to avoid a mess. The eggs are served inside their shells on the Seder plate. At the start of the Seder, parsley or another non-bitter herb is dipped into salt water and then shaken off. The dripping water represents the tears that Jews shed as slaves under Pharoah. One of the central rituals during Passover is the eating of the bitter herb. Bitter herbs (maror) are a reminder of the bitterness of the slavery the Jews experienced in Egypt. The most common choices for this are horseradish root, romaine lettuce and endive. Horseradish root needs to be prepared in advance. Horseradish is part of the mustard family, harvested for its root which produces a tear-inducing mustard oil which when crushed, gives it spice and heat. The horseradish root is peeled and rinsed well. It is then grated by hand or food processor. At this point you need to add vinegar to stabilize the horseradish and keep it from browning and losing its pungency. TIP: It’s the amount of time between grating the root and adding the vinegar which defines the heat of the final condiment. Adding the vinegar almost immediately will create a pretty mild horseradish, while letting it sit for about five minutes will produce a much punchier condiment. The first real taste of food will be a sandwich of bitter herbs, matzo and charoset. Charoset is a sweet condiment made from ground apples, nuts and wine. The paste represents the mortar that the Jewish slaves used to construct the pyramids for the Egyptian pharaohs. This sandwich is eaten before the main meal and after the telling of the story of the exodus from Egypt. It is hard to make a food that is supposed to represent mortar look appetizing. So the focus is on the flavor. Everyone has their own twist on charoset – some people cook it, others finely chop it. The final item on the Seder plate is a bowl of salt, which is meant to symbolize the tears of the slaves. Now it’s finally meal time and the Passover dinner staples are so good that we really stick to the script. Passover is all about simple food. One of the most stand-out food traditions of Passover is the exclusion of leavened grains and breads from the meal. Three pieces of matzo are placed within the folds of a napkin on the table - unleavened bread symbolizes the speed and haste required during their flight from Egypt. There was no time to wait for bread to rise before they fled. For those of you who are not familiar with Jewish food, Gefilte fish is not a fish. It is a classic Jewish appetizer made by grinding together several types of fish and combining with onions, eggs, spices and possibly breadcrumbs. The mixture is formed into patties and poached in a strong fish broth. Gefilte fish is best served cold and is often accompanied by a pungent horseradish. 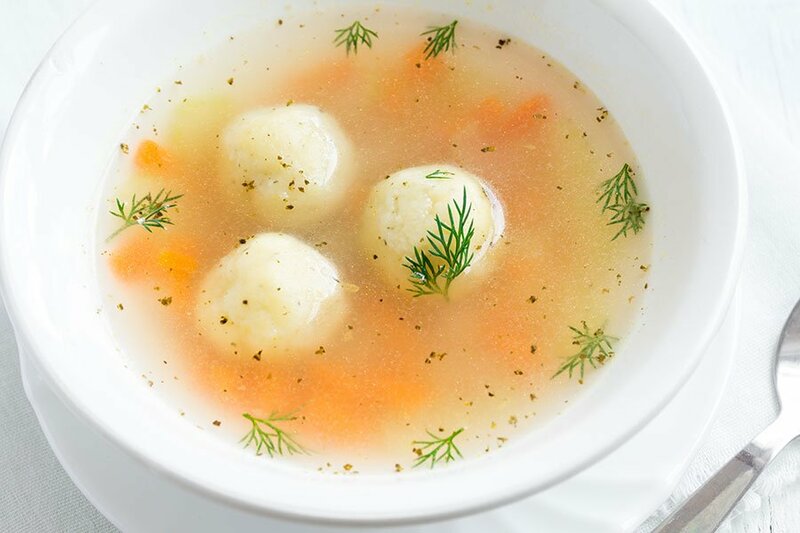 According to Joan Nathan, chef and grande-dame of Jewish cooking, nothing says Passover like a good bowl of matzo ball soup. Historically, matzo balls are dumplings made with the leftover crumbs of the Matzo bread that Jewish people got from their local bakery. Today, chicken soup with matzo balls is the highlight of most Seders, and the most iconic Jewish food this side of the bagel. Our traditional beef brisket starts with a choice cut brisket that includes both the first and second cuts. The second smaller cut is the only cut with ample fat to withstand a long braise and compensate for the loss of moisture. Our brisket is braised to perfection with carrots, onions and celery. Once it is done, we thinly slice the meat and then submerge the slices in the braising juices for a short time to moisten it more fully. It is understood that brisket is accompanied by Tzimmes on a Jewish holiday table. Tzimmes may mean “big fuss” in Yiddish, but Tzimmes is quite simply a sweet, tart and savory vegetable stew with lots of orange vegetables - carrots, sweet potatoes, butternut squash – slow cooked with dried fruit, warm spices, a touch of honey and orange juice. 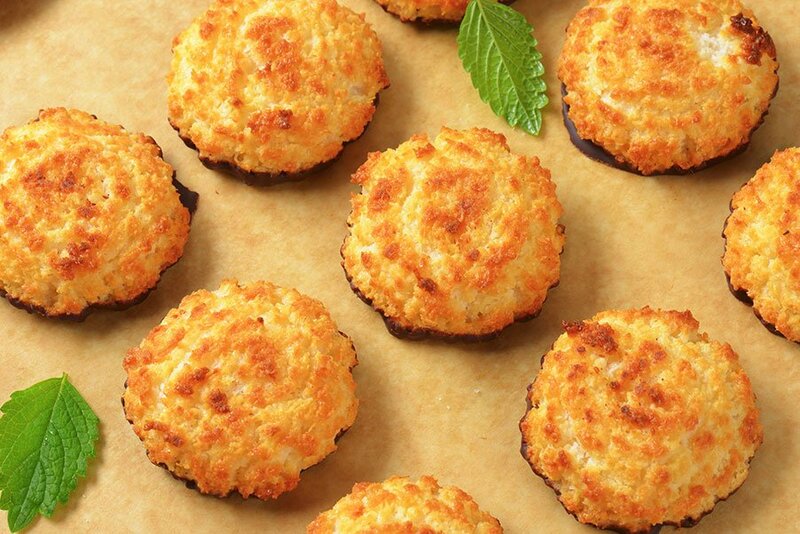 Crunchy on the outside and chewy on the inside, a good Coconut Macaroon is the perfect ending to Passover dinner. While Coconut Macaroons do not have a symbolic tie to the story of Passover, they have become a fixture on the Jewish holiday table. CALL EGGWHITES CATERING TODAY at (305) 892-2066 TO BOOK YOUR PASSOVER DINNER! Let us do the cooking this Passover so that you can spend more time with family and friends. We promise not to tell your Bubbe that you didn’t make everything yourself! Ann Jones writes for Eggwhites Special Event Catering, a Miami-based luxury catering company. Copyright © 2019 Eggwhites Special Event Catering.